Q: Why use BruControl for my brewing? A: BruControl is a simple to use, flexible solution to run your entire brewery or process equipment. It leverages inexpensive, commonly available micro-controller hardware and requires no experience setting up or operating automation control systems. You can build a basic single vessel brewery and utilize BruControl as a custom digital control panel, or create a fully automated solution running a multiple-vessel brew rig with advanced systems such as automatic pump control, water filling, sparging, boiling, and fermenter transfer using electric valves, flow sensors, level sensors, etc. BruControl can grow with you as your needs grow, without major rebuilding. You can build just a brewery, or add a monitored/controlled fermentation system, a monitored/controlled dispensing system, and more. These systems can be in one room, one building, or across the country! Q: Does BruControl include any hardware? A: No, BruControl is a software solution. Bring your own hardware! Arduino type micro-controllers are inexpensive, yet function very well for this purpose. They are incredibly powerful, run cool, are reliable, and are not proprietary! We support several models currently, with more to come. The current recommended controller, the Arduino MEGA 2560 provides 45 digital I/O, 12 PWM/Analog outputs, 16 analog inputs, up to 4 high frequency counters, 10x 1-wire sensors, 4x RTD sensors, etc. Most incredibly, this currently runs ~$15 from many online merchants! Q: Why would I use BruControl instead of tried-and-true hardware controls such as PIDs, timers, alarms, switches, and light indicators? A: Primitive brewery control panel designs used these types of dedicated hardware electronics because they were all that existed. But like the brick phone, their time has passed. BruControl does what these items do in software, meaning they can be easily configured and changed. Your control panel is now a beautiful monitor or tablet, not a gigantic electrical box with tiny buttons and archaic codes. It can be customized by you to suit your needs, not be a clone of someone else’s. You can add and expand across your whole brewery when you are ready. If you wanted 35 simultaneous PIDs, you can have it (we don’t know why you would, but feel free to brag about it!). Ultimately, the biggest benefit is automation – where these devices can interact and do their job when it is their turn, according to how you want them to. Also, control panels built with software like BruControl can be smaller, and simpler to wire and you don’t have to cut so many holes! Q: Automation systems are expensive and I am on a tight budget. A: There is no doubt that more electronic components adds complexity. But cost is dependent on the components used. For example, compare the difference for a 3-vessel brewery between a dedicated hardware electronic control panel and a BruControl solution. The dedicated solution uses 3x of a popular PID model at ~$45 each plus a timer at ~$40 each is ~$175, where a BruControl system would run ~$115 for the software and micro-controller interface. Adding a PC and monitor will be additional cost, but you probably already have one available. Additional savings would also be realized from the elimination of switches, alarm, light indicators, and extra wiring in the BruControl system. Q: Why would I automate my brewery – won’t it take the fun out of brewing? A: Not at all. “Automation” can mean simple temperature monitoring and control, or it can mean one button, end-to-end brewing. Automation helps the brewer focus more on brew science and specific details rather than manual tasks. It creates more consistent, higher quality beer and allows for controlled variations to dial in the exact type of beer a brewer wishes to produce. Brewing with automation is still brewing – its just better! BruControl will allow you to grow into more automation when you are ready. Plus BruControl can monitor and control more than just your brew station. Q: Can I convert my existing brew or fermentation controller to BruControl? A: Yes! First, BruControl can work with essentially any temperature probe: thermistor, 1-wire (DS18B20), RTD, or analog temperature. If you already have an Arduino or similar supported micro-controller interface, then all you will need to do is install the interface firmware, install BruControl, configure and go. If you have another controller, you will need to swap it out with a compatible micro-controller interface first, but this is often straightforward. For example, if your current controller (like the STC style) uses a thermistor probe, you can continue to use these with BruControl. Q: BruControl looks complicated and I am not a programmer. A: That’s not a question, but we’ll run with it… BruControl is immensely flexible compared to other software or hardware solutions. This gives you a big blank canvas to create the system you want. This may seem a little daunting at first, but trust us – you won’t break anything! Also, BruControl requires no programming skills. Arduino type micro-controllers normally require programming skills and software, but not with BruControl – we have done the work for you! You don’t need to read or write any code or even install any additional software! Q: What about BruControl’s scripting language – doesn’t that require programming skills? A: Okay, you busted us. If you want to build a digital control panel which mimics a hardware panel, you don’t. But if you want to create a higher level of automation, where these controls operate themselves automatically, then you will need to write some code. Now, that said, the code is really simple to understand and master. We wrote it for people, not Watson. Here is an example: “Mash Tun PID” Target = 152. Do we need to explain what that means? Probably not, so there you go. Q: Why isn’t BruControl free like other software on the internet? A: As the old saying goes, “no such thing as a free lunch”! Seriously though, this product is supported by professional developers, which will ensure regular updates and accountability to solving issues and making the product better suited to your needs based upon your feedback. We also believe it is and will continue to contain many more features than anything currently available, free or not. These include analog inputs/outputs, high frequency counters, multiple temperature probe types, flexible and customizable user interface, multiple distributed micro-controller interfaces, multi-tasking, calibrations, and automation scripting. Q: Since BruControl needs an micro-controller for I/O, why shouldn’t I just use one alone to run my brewery? A: You ever try to program and test one of these things? You need to know how to code, research specific hardware instructions, learn about the libraries available, and go through the cumbersome process of writing, uploading, debugging, testing, etc. If you write your own program from scratch, plan on an insane drain of your precious time. If you acquire one of the versions available off the internet, you will either need to modify it to suit your needs, or build your brewery to someone else’s specification. Also, if you wanted to add a component, you will have to repeat the process all over again. Talk about no flexibility! Plus, forget about a nice user interface – unless you like a 40 character display from the 1970’s. 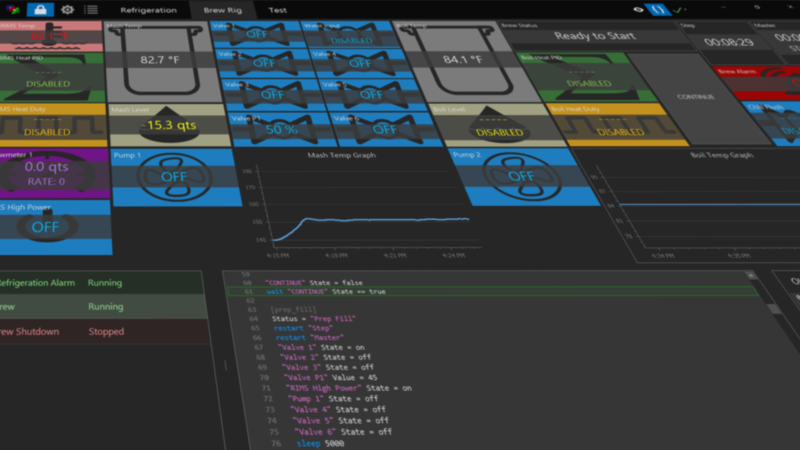 BruControl makes all of this super-simple and gives you a beautiful, customizable interface at the same time. Q: Why does BruControl run on Windows? A: When creating BruControl, we wanted a robust, proven platform. We know Windows is loved by many, hated by some. But we have found it to be a rock-solid foundation for BruControl. And since high-end computer hardware is not required, you can use an older PC or a modern inexpensive mini-PC. Also, while BruControl can be run intermittently, such as for a single brewery controller, it was designed to run full-time, where an always-on PC solution is needed. If you desire to use a tablet or other device to serve as the user interface, we recommend a remote desktop solution like Windows Remote Desktop or TeamViewer, both which support multiple platforms such as Windows, Mac, Linux, iOS (iPhone or iPad), Android. Q: What is the difference between the Basic and Advanced versions? A: BruControl Basic allows for communication with one interface, connected via USB cable. BruControl Advanced allows for communication with multiple interfaces, connected either via USB or via network (Ethernet or WiFi). Q: The micro-controller interface I would like to use doesn’t seem supported by BruControl – now what? A: Contact us and let us know what you would like to use. Depending on the application, we may be able to create the firmware needed for your interface. A: That’s cool – Contact Us! We promise to reply quickly!